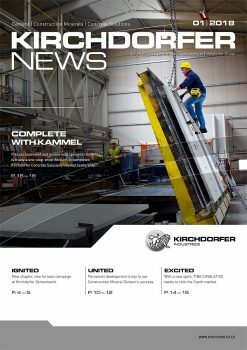 This latest issue presents the topics corporate culture, human resources development and important innovations made by Kirchdorfer. Pursue with us the annual ignition of the rotary kiln in Kirchdorfer Zementwerk, the restart of TIBA CHVALETICE in the Czech Republic and how lived company values increase coherence and camaraderie. Learn more about the consolidation of the added value chain by KIAS Recycling and about the parallels between cheops pyramid & the highway bypass in Budweis.